For more than a month now, the general stock market has been stuck in a narrow trading range. When I last looked at the technical outlook for December, I showed how it looked like a flag formation within a rising wedge pattern. The longer we meander without really going anywhere, the more power we build up for a move out of this trading range. That’s because as people take positions, either long or short, one side will invariably be wrong and have to retrace their steps. And in doing so, add even more fuel to the trend underway. 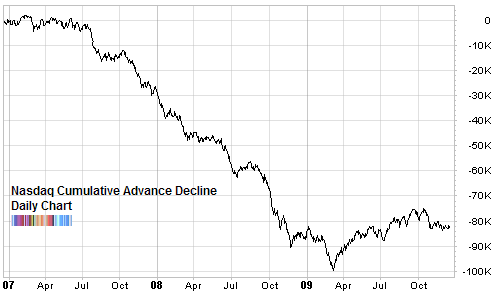 The question then is, will the market break down or up? While this simple explanation may appear logical, it contains a flaw. Take a look at the long term chart of the NYSE cumulative breadth and you’ll see it that there is no discernible relationship between it and the S&P 500 index. Rather than some surprising, ‘hidden’ strength in the stock market, there is another explanation. As I mentioned in My Year End Strategy, interest rate sensitive issues trading on the NYSE have zoomed higher as a result of the Fed’s zero interest rate policy. These components have grown to take up a considerable share of the total NYSE issues. So it isn’t surprising then to see them skew the advance decline statistics like this. 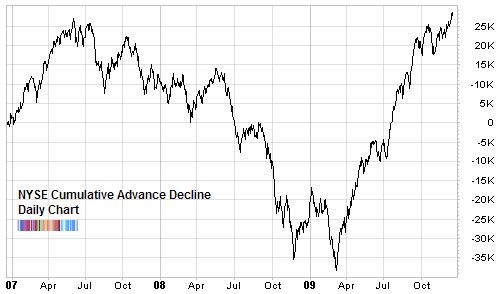 Unlike its NYSE counterpart, the Nasdaq cumulative advance decline has barely been able to recover from the March lows. 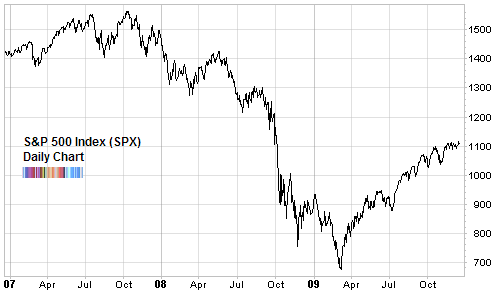 It is not only far away from the 2007 top but it is actually lower now than it was in September and October. One final thought. This range bound trading has helped the bulls by allowing the 200 day moving average to continue to rise and close the gap between it and the daily close. On October 19th, when the S&P 500 first hit the 1100 resistance level, the long term trend line was at 910. And on November 16th, when it again bumped the same resistance level (1109) the 200 day moving average was at 932. Finally, right now, it is at 965. The 200 to the Rescue! This means that, relatively speaking, the S&P 500 is only 15% above its long term trend. Since we know from the long term historical behavior of the S&P 500 relative to its 200 day moving average that it tends to get top heavy at the +20% level, theoretically, the index can go as high as 1170 from here. Thanks Paul, decisioupoint is a good service but as I showed in the followup, the real question is the differences in data providers. You can see the OCO charts I showed here.